Back of the Cereal Box: He Shoots What? Um, check out the simian. 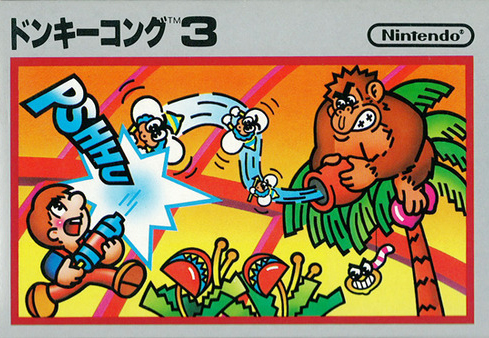 I know what Donkey Kong is doing here: He’s shooting bees from that jar, even though that’s not something he actually does in Donkey Kong 3. But I wish whoever designed the box art had chosen to color the jar differently then he colored D.K., because it’s a bit suggestive — and, consequently, a bit disturbing. Is this why Donkey Kong 3 wasn’t a success? That' what I was going to say, Bryan. It's a bit too simplistic to be as fun as the original. Besides...who was this Sam guy? Where was Mario? Apparently Mario could be a plumber, a construction worker, a demolitions expert, or even a freaking doctor; but making him an exterminator would have been going too far. Bryan: No, you're totally right. The game just wasn't fun, nor was it all that Donkey Kong-like. Justin: Stanley. Not Sam. And yeah, I wonder why they brought in a new guy who pretty much looked exactly like the old guy. Nathan: I would have been find with Mario being the exterminator. But it's not Mario; it's his mustache-less lookalike, Stanley the Bugman, who has more or less never been seen again. I think Stanley is hanging out with Foreman Spike in the Hall of Forgotten Characters. Video game crash kill the game. It's fun if you like shooters.